There is a certain level of preparation required to attend an interview session. And each interview session is designed with some interview questions and answers. For instance, a marketing or sales manager interview can be scheduled with the expectation of hiring a suitable candidate. And to find such suitable candidate, the interviewer prepares certain types of questions and answers. These questions and answer help the company recruitment process. 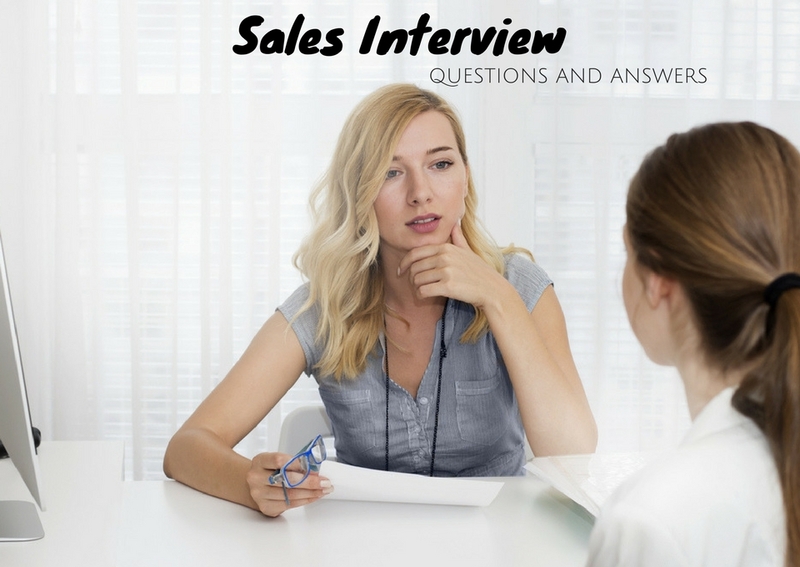 While arranging a sales interview there are some repeated and must interview questions, which helps interviewers to understand the behavior of the candidate. 1. Why do you think that you are the right candidate for the job? While applying for sales jobs and attending a sales interview, one of the common questions that every interviewer presents to the candidate is “why do you think you deserve this job”. And while answering this question the candidate should be clear and confident. Basically, the interviewer is trying to check the level of confidence within the candidate. If the candidate with positive level of confidence answers the question quite impressively, then the candidate gets that job. With this questions right answer, the interviewer or the employer wants to know the candidate’s ability and interest in the sales field. Showing interest in the sales field and actually working in the sales field is two different things. Because if a person is really interested in working in the sales field and passionate about sales, then they present an impressive answer for the question. 3. What motivates you to do sales work? Sales job is not that easy as it seems. Candidates with sales background also struggle in the field. And that is why the interviewer asks such questions during interview to understand the relevance of their motivation in the sales field. However, while answering this question the candidate must know the qualities needed for the job. A person working in a sales field must go out in the field with patience. Patience, is that one thing which motivating a sales employee. 4. How do you take rejection? This question is asked to the interviewee to know how would they manage tough situations. A sales employee requires to maintain a certain level of patience in their working environment. Because in the sales field an employee is supposed to approach many kinds of people for their business purpose. And as it is business, there might be people who will behave differently with sales worker. And such kind of different behavior can make these sales employees undergo some differences, which can cause some problem later on. And that is why the sales employee should take rejection in a positive way. 5. How’s your sales track record? This question is for working employees wherein which they obtain a certain level of experience in the field. A sales employee requires to handle all sorts of marketing and sales related things. A sales track record is something which matters to the company in the sales field. And during the interview, the interviewer definitely would like to see those sales track record to evaluate the capabilities of the employee. This is a common question which all the company employers present it in front of candidates or applicants. With this question the interviewer would like to know the level of hard work and excitement the candidate shows to get the job. If the candidate is desperate to get the job, then it’s quite obvious that the candidate will definitely research more about the company in the sales field. Therefore, based on that information the interviewer identifies the capability of the candidate for the job. 7. Show me a selling demonstration? Most of the sales job requires a demonstration of the candidate skills and ability in the field. And that is because it is a sales job. For example, during a sales interview the candidate will be asked to sell a thing which can be a file, pen or paper. And at that time the candidate should show their skill and ideas to sell those things immediately. Therefore, the candidate must convince those interviewers so that they buy those things. 8. Are you comfortable with cold calls? When a person decides to work in the sales field, then it is quite obvious that the person should be comfortable with all sorts of services included in the sales area. However, people in the sales field are supposed to handle cold calling services. Therefore, the interviewer asks such question about cold calling because some candidates are not ready to start cold calling. And at that time the candidate should take a positive approach and move on with that job. 9. Are you comfortable with targets? A sales job comes with a complete scenario of targets. Some people enjoy working in the environment of targets. Targets in the sense, a sales employee requires to sell a certain piece of things on an average basis according to the targets fixed. Therefore, during an interview when an interviewer asks such question the candidate must rely confidently that he or she is ready to work under pressure of targets. And targets make their work go fast and easy. 10. It is a field job. Most of the sales job comes with a condition that for the first few months of job, the employee is supposed to do some field work in terms of sales. And candidates should be prepared to answer such question. And while answering that question, the candidate should be true with their answer. Some people might not be comfortable working in the field and some might be interested. Therefore, the answer should be quite honest instead of a lie. 11. How do you keep update on your target market? candidate for a sales position. This question is asked by the interviewer to judge how well aware you are about various techniques of keeping yourself updated. They also judge on your zeal to remain updated in the field of your profession that may incur most benefit for the company. 12. Which thing do you take seriously, Customer relationship or new client hunting? Here comes a tricky question that many managers ask to test the inner quality of an aspirant while conducting an interview for a sales position. In this question, you would be judged on your capacity to prioritize your work. A tricky answer keeping both the aspects balanced could help you win hearts of the interviewers in a single go easily. 13. Being a sales person what few questions you would like to ask your prospect? The sales job is a job of convincing and communication. The way you could communicate your offerings by understanding the requirements of the client is the ultimate mantra to win the target. In an interview, the interviewer may ask this kind of question to gauge your communication skill as well as convincing power. A smart highlight on few important ways to convince your target can help you win the question. 14. How could you engage Social Media in your selling process? Social Media is an emerging tool for gathering knowledge as well as for advancement. So, the involvement of Social Media in every profession has become a must to achieve success in the considerably short period. How you are aware of the best use of this tool and how you can implement the same in your profession is what judged through this question. Your knowledge and experience in engaging social media in your last job would be helpful here. 15. How do you research prospects before meeting or calling? What sort of information do you look for? Through this question as well, the interviewer would like to gauge your social communication techniques which are most crucial in determining and acquisition of new clients in the process of deal conversion. You are required to answer on the techniques how you research and acquire data about new clients before you meet them and also on your thinking direction for gathering information on them. 16. What would be your task/target in your first month if hired for this position? This is a very common and favorite question for every interviewer. Through this question, the interviewer looks for the positive mindset of the candidate how they are going to start up in a new position and a new job. The willingness to work afresh with the new set of targets with a positive mind is always welcomed by every manager. 17. When do you feel to stop pursuing a client? You should understand your limits and also respect the image of your company for which you work. You should be able to go to any extent or accept the situation in your step towards the protection of your company’s image. In this question the interviewer wants to understand these traits in a candidate. This is a witty question which you should answer tactically without harming the policies of the company. 18. What would be your action/reaction on losing a sales deal? An interview is sometimes technical based on practical experience but mostly it is based on mental ability to handle various adverse situations. This is one such question through which the interviewer aims to understand the mind set of the candidate in case he/she fails to achieve a deal. How he/she is going to act on it and what would be his/her gain from the situation, is highly judged by the interviewer. This question is basically aimed to understand and judge the mindset of the candidate. How balanced is the candidate in respect to the job and target achievement and also undertaking of various ways to reach the goal is determined from the answer to this question. So, a confessional answer direct from the candidate’s mind achieved after years of experience can be a great answer to it. 20. Where do you like to see yourself in the next 3-5 years? Your vision for life and expectation from the job as well as confidence on oneself is tested through this question. An experienced interviewer is exceptionally smart to estimate the depth of the candidate’s aspiration from life. Here is needed a very frank yet consistent answer. Note that a very hi-fi thinking and over estimation of self may lead to a negative impression. Here is another common question and you may count it as a near to closure of the interview round. This may be asked to lighten the mood of the interview where the interviewer is trickily willing to know the strength of the candidate in respect to the job. You would definitely win over the show if you could precisely answer this question with your achievements from the past experiences. 22. What package are your expecting for this position? Speak your heart out on what you like to take home after a dedicated month of sincere carry out of the tasks related to the position. If you conceal or shy in this answer then you may end up compromising with your salary. So better negotiate in the first phase. 23. What questions do you have for me? You may consider this question as a closing question for the round and you may utilize this opportunity to speak your heart out to know whatever you wish to know the company or its rules and regulations. You may be highly talented with numerous certifications and trainings related to the job position, but while facing an interview board many candidates lose confidence and ultimately end up messing up everything. The above mentioned questions are potential enough to make you confident while facing a sales interview. So, pull up your socks and get ready to face a room full of managers with super poise.